A reality of casting rod and reel into the waters, some fishermen hate it when it rains, and they call off the trip. However, you don't have to be that kind of fisherman. In fact, with the right understanding, you can keep fishing right through the rain. We hope you take at least one fishing tip or fishing technique with you on your next rainy weather fishing trip. A lot of anglers live by the weather forecast, but it doesn't have to stop you. In fact, the rain becomes another opportunity to crank in the big one because of how it breaks the surface and makes it harder for the fish to detect you. Rain creates a current in the water; plus, it flushes the nutrients into the water, which can all turn on the biting time in a big fashion. If you're already wet, why not add some optimism to it and try to catch some fish. 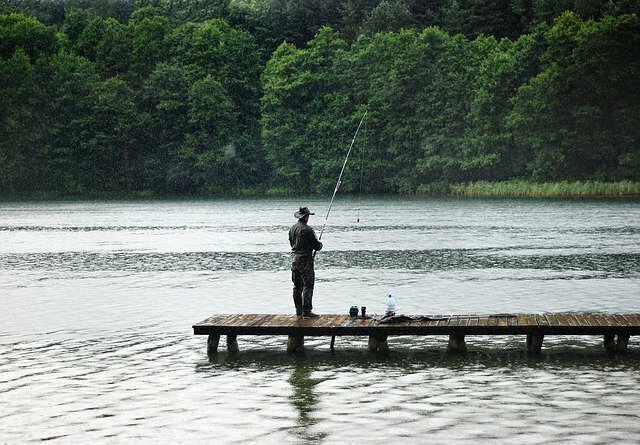 As the rain pounds the river or lake and the clouds block the sun, you'd be surprised at how fishing in the rain can be the perfect time to cast a line out. During this period, you might take advantage of a topwater bait because fish will usually display a greater willingness to roam around and pursue baits. They're more likely to aggressively attack a topwater bait that swims along the surface of the water. You can reel in some epic trophy fish on these rainy days with a stick bait. Luck may also favor you if you were to use a baitfish, seeing as bass love to go near the surface during this time. While fishing out in the rain, you might try to identify and fish near some of the classic fishing school points. When the sun hides behind the clouds, the bass have a higher likelihood of coming out during the rain and roaming around. Bass that had once been locked in on a sweet spot will spread out more. If you want to increase your chances of cranking in a monster fish during this time, you might speed up the boat a little. No matter what you fish for, all the fish tend to spread out during this time, so the faster you move around, the higher your chances of getting a strike. For example, if you happen to be using a spin bait, start burning your bait. If you happen to be casting out a worm, don't soak the worm as long. Fish have a higher likelihood of acting aggressively toward baits during this time, which becomes a wonderful opportunity. You probably don't have to work quite as hard to get the fish to bite on your hook when it rains. That's why it sounds funny that a lot of fishermen won't go out when it rains. The surface runoff will add nutrients back into your water, and this will attract some of the baitfish. In turn, the bass and other predators will come hunting for the baitfish during this time. All you have to do is focus on finding a place where some of the runoff goes back into the lake. However, it should be a clean runoff or you may not find any fish there. Bass fish and many of the other apex predators of the water will travel great distances to feed on the baitfish. You might find this near a culvert pipe, a mud line or a creek inlet. A strong focus on the draining areas can yield you a lot more fish. Especially when the rain starts to pound the waters, you can reel in a lot more fish. One of the biggest concerns about fishing in the rain comes down to the fact that you could get caught in a lightning storm. This can be extraordinarily dangerous. If you notice the weather forecast predicts rain and lightning, you should stay home or wait out the lightning because this can be dangerous since water is a conductor of electricity. The problem with this is how you also happen to be the tallest thing in the water, which can turn you into a lightning rod. Let's say you're on the river, and you don't have anywhere to go. What do you do? If you happen to be near a boat launch, you might quickly head to the outhouse. If possible, it's not a good idea to be on the water when it lightnings. You may also want to avoid huddling under a tree because this can be dangerous standing to close to it. Instead, you might hunker down and squat low but stay off the ground except for the feed. This makes you less conducive to the ground since lightning can shoot up from the ground. If you happen to be fishing in a metal boat, this is especially dangerous, and you should get out as quickly as possible. Fiberglass doesn't conduct electricity as much, but it can still be dangerous. Before you head out fishing, you have a couple things that you should have when fishing in the rain. First, you will want to have a collapsible staff. This will be easier to carry on a belt, and it helps you to stabilize in rushing waters. Next, you will also want wading pants, especially if you do fly fishing in the rain. You will want a pair that is antimicrobial to keep away unpleasant odors and stop mildew in its tracks. In addition, you will need a wading jacket that is breathable and waterproof. Finally, you will want to have a space blanket on you. This could save your life in the event that the water gets too cold. It keeps the hypothermia away, and it reflects body heat back to you. Light rain is the first type of condition that you might experience while out on the waters. The conditions might be moderately moist, and you're best sticking with your usual techniques in this rain condition because fish behavior doesn't change much with this weather. Next, you have a moderate level of rain. This happens when it has been raining for a moderate length of time, or it has rained hard for a shorter period of time. With moderate rain, the fish tend to sit deeper below the surface, which makes surface fishing quite ineffective. Instead, you may want to cast a line closer to logs, rocks and shrubs as this is where the fish will often be hiding. Heavy rain happens when it has been raining hard all day. You will see a noticeable rise in the water levels, and you should take safety precautions to stay safe. Your best bet during this time will be to gravitate more towards a streamer or flash. Pay special attention to the type of wind you might have while casting. With rain, the need for a delicate presentation becomes next to non-existent because they can't spot threats as easily, and they're more vulnerable during this time. One of the best advantages to fishing in the rain is how most other fishermen won't be on the waters during this time, which means you have the lake to yourself. This can give you a huge advantage because you don't have to share the waters with noisy speedboats and jet skis that are scaring away all the fish. Another advantage of fishing in the rain is how most people don't even understand the huge advantage they have when fishing in the rain. After the downpour has reached a halt, what do you do next? You switch your techniques and bait once again. This transition will be suited best for the streamer patterns and dark colored bait. You may want to experiment with different bait to see which one the fish like best after a heavy downpour. You want to pick a pattern that can stand out in the possibly murky waters after a heavy rainfall. Even during the rainfall, you may want to pick a darker colored lure because many fish, like bass, will have a harder time with seeing a darker color. It will stand out more with a good silhouette. Black and blue combinations during this time are usually the best because it could replicate a black craw that has blue pincers. Looking at the water temperatures is one of the key ways that you will understand fish behavior. If the water happens to sit in the 60-degree Fahrenheit range or higher, the bass will be in the shallow beds. We hope this pro tip for bass fishing will help you in rainy weather. If it is colder, however, they will usually swim deeper. It depends on the temperature of the rain, but it can sometimes change the temperature of the water for either warmer or colder. Sometimes the wind and rain can make the waters turbulent and difficult to fish. You want to seek out a spot that shelters you from the wind like a bay area that will still give the fish access to food. In addition, this type of sheltered spot will usually give shelter to the larger fish, and they will sometimes crowd this area. Stormy weather often gives fish this false sense of security, which is what tends to make them bolder during a storm. They aren't as prepared for overhead attacks. One of the most excellent opportunities that you will find while fishing in the rain is near smaller streams that drain out from the lake. Let's say it sits near farmland. The advantage here is how the erosion will be at its peak during this time, which gives you a huge advantage. This is because the bugs and worms will be out in full swing, but they won't be filthy with muck, which attracts the fish to the area. Many a fisherman has been saved from getting skunked by taking his rod and reel to the mouth of a stream and casting out a line. Before you head out for a fishing adventure, you should always gauge what kind of safety you will have. Pay close attention to the weather forecast, and if you see the rain will come with thunderstorms, it isn't worth heading out. Like always, you should always bring a life jacket because the waters could be tougher to swim especially in the rain. In addition, you should be sure to tell someone where you plan to go fishing because it could save your life. Tell them when you will return as well. Once you head back in the truck, you may want a change of clothing because nothing feels worse than getting out of the rain and being stuck in wet clothes. When it's raining out, you may also want a pair of waterproof boots for your own protection. For clothing, you might choose something that will dry quickly. Some people find it calming to fish in the rain, but if you plan to speed across the waters during a heavy rain, you might feel uncomfortable as the raindrops continue to needle you in the face. Instead, you might carry a helmet to help with this. If you have a visor it will especially be useful to individuals who wear glasses. 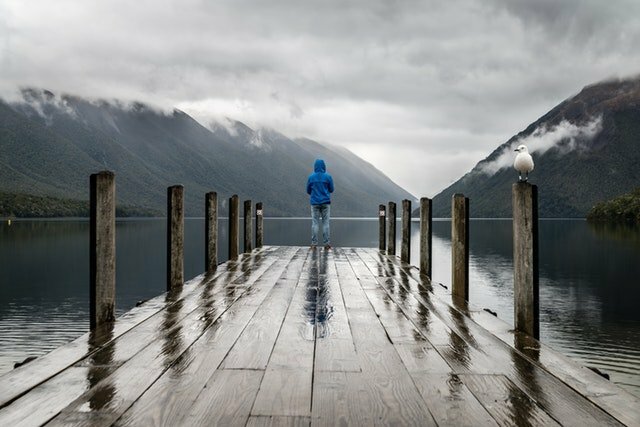 If you have ever been walking outside in the rain with glasses, you know how the rain droplets can completely cloud up your vision, and this can be dangerous in a boat. A rain suit or rain gear can also be useful in rainy weather. When it happens to be cold and wet out because of the rain, you might find how you have a difficult time with keeping your hands warm. What can you do to combat the problem? Brian Snowden, a professional fisherman, says that he understands this difficulty because of how he went through it himself. To get through the problem, he wears rubber surgical gloves underneath his neoprene gloves. Neoprene is a material already known for helping with keeping your body warm and dry. On top of rubber surgical gloves, you don't have to worry as much about the rain falling and causing you problems with staying warm. Some people have had difficulty with making the wind and catching fish when its windy out. In fact, they go to a shelter inlet or bay to have better luck fishing. However, you can also use the wind to your advantage when it rains because many bass will act more aggressive when it's windy. To take advantage of it, you might pick up the pace within the boat to fish a little faster in some of the windblown areas. The advantage of a little wind is how it stirs up the plankton and the baitfish, which has been known for making the bass more aggressive. Some fishermen have said that when they're catching nothing, they might go prowling for some winds. However, you don't want too much for wind either. Whenever it's windy out, you don't want to fight against the wind. Instead, try to work with it to see if you can't cast farther. Spinnerbaits in rainy waters have become a favorite bait among bass and other larger predator fish because of how it's big and easy to see in the rain. As it rains, the barometer also tends to drop a bit. The result? Bass have a higher likelihood of feeding during this time, and they're increasingly likely to chase after the fish. With less light from the sun, bass also have better coverage in the water, which makes them more likely to move to the edge of the cover. This results in a bigger strike zone, and you don't necessarily need to put the bait directly in front of the bass's nose to get it to chomp down on your hook. In fact, all you have to do is bring it close enough and the fish will sense this vibration and take after it. After the rain has begun to settle down, you might want to choose a smaller spin bait because you want to mimic a piece of bait that doesn't look too suspicious for him to eat. You can have success going for as small of a lure as 1/8 ounce. It might sound quite obvious, but when you first take to a new lake, you might not know where they bite. After a while, however, you start to get a sense for where they will bite the most. Take to trolling this area during a rainstorm, and you will increase your chances of catching a big fish. Another reason that spinnerbaits have become popular during a rainstorm is because of how this lure doesn't snag on seaweed as easily. In this way, you don't have to look out for rain as much which can make seeing the seaweed more difficult in a heavy rainstorm. If the bass seem unwilling to strike on a spin bait, it could be because they have taken to guarding their beds, which means they won't chase the lure. With the rain, however, it makes them less likely to scare. You can take advantage of this by casting into their beds. Fishing in the rain might be somewhat uncomfortable for some people, but it also tends to be a great time to go out fishing because the fish are usually more active in the rain. In addition, you have better cover so that the fish aren't as suspicious of the lures you drop. It gives them a false sense of security. Fishing in the rain can be a calming and fun experience for a lot of people. What is your favorite fishing tip? Feel Free to let us know in the comments below.